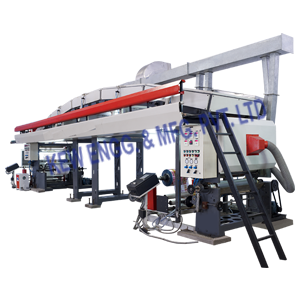 We have been successfully manufacturing, exporting & supplying all types of Lamination Machine Manufacturer since last 25 years from Ahmedabad, Gujarat, India. We are winner of 3 times National Award and 2 times International Award for Quality manufacturing. For Lamination Machine, we have processed all types of material like Polyester, BOPP, LD, PVC, Paper, Film, etc. We have more than 100 installation of High-Speed Lamination Machine in India and overseas like Saudi Arabia, UAE, Dubai, Sharjah, South Africa, Nigeria, Ghana, Congo, Kenya, Zambia, Sri Lanka, Bangladesh, Malaysia, Pakistan, Nepal, Russia, Thailand, Indonesia, Brazil, Colombia, Venezuela, Argentina, Mexico, Canada, etc. Laminated materials are widely used for Plastic & Paper Materials like Milk Pouches, Food Packets, Wafer Pouches, Cloth Bags, etc. Our Lamination Machine are used for Laminating above all types of materials. Heavy duty C.I. Cast iron & Heavy fabricated structure. Cantilever type impression pressure assembly actuated with pneumatic piston for rubber roll Doctor Blade and Nip Roller. Fully insulated imported special glass wool sheet fitted in the panel (Top side & Bottom) for controlling heat loss. Machine Speed 60 – 200 M/Min. Material to be Laminated Polyester/Poly/Paper/BOPP/Aluminum Foil/HDPE Fabrics etc.